PVF has established several fellowship programs in an effort to provide hands-on learning opportunities for university students outside of the classroom. One of these programs is the East Palo Alto Social Venture Fellowship, an initiative that supports an undergraduate student at Stanford to work in East Palo Alto for a year on an innovative project, partnered with a local nonprofit. Through the Fellowship, Irene is encouraging community-led urban planning through work with the East Palo Youth Arts and Music Center project, a community initiative working to build a center dedicated to the arts programs arising in East Palo Alto. The Youth Arts and Music Center project is a collaboration of organizations including the Mural, Music and Arts Project; Live in Peace; Youth United for Community Action, and Stanford’s John W. Gardner Center for Youth. The center is slated to open in 2014. The Youth Action Team has been encouraged to learn relevant urban design skills by participating in activities such as this drawing workshop at Stanford University. Because the arts center is being built for youth, the East Palo Youth Arts and Music Center project seeks to design the urban space alongside the community’s youth. To do this, they created a Youth Action Team. Irene is working with this youth team, helping them develop relevant skills like project design and implementation, and urban design theory. Through these lessons which include site visits and interactive learning, she is helping to empower the youth to take charge of the way their community is being developed. 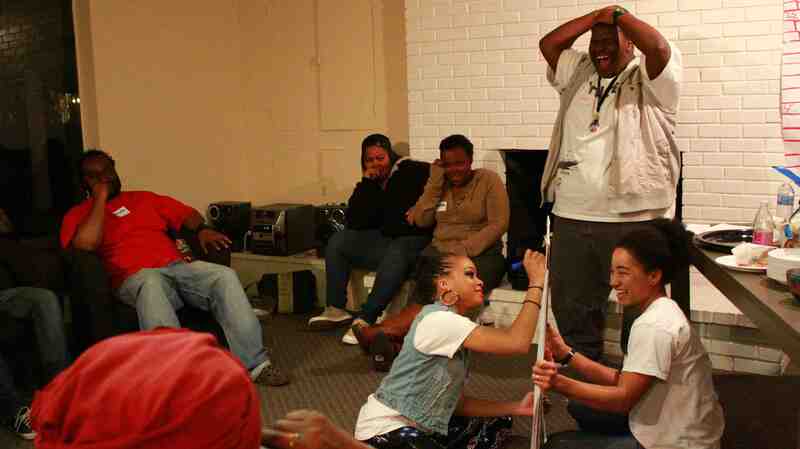 Members of the Youth Action Team collaborating at one of their weekly meetings. PVF visited one of Youth Action Team’s weekly meetings recently to see the work Irene is doing. The meeting was packed with an array of activities. The team broke into groups and sketched floor plans for the future arts center. They also discussed the details of an event they are planning for East Palo Alto youth complete with musician performances, and interactive workshops in urban design to get even more community input into the project. 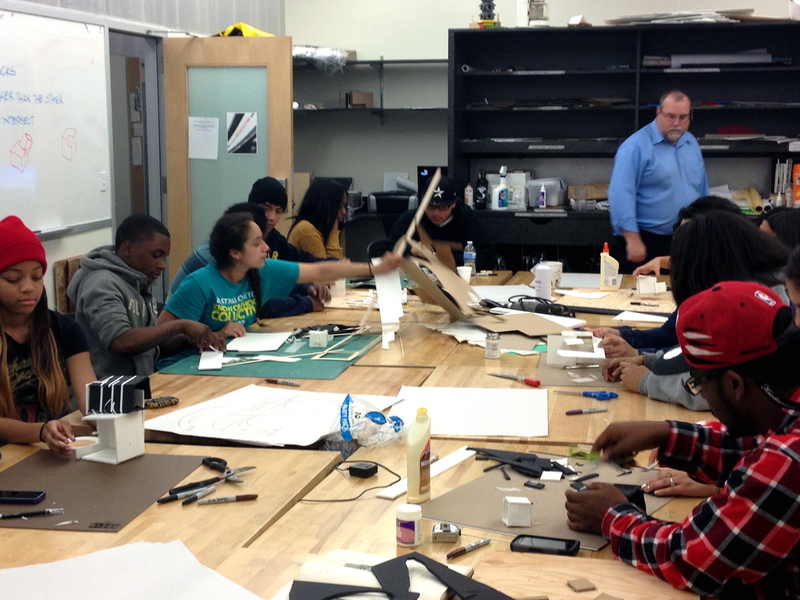 The Youth Action Team regularly goes on site visits to learn about other art and youth initiatives in the Bay Area. 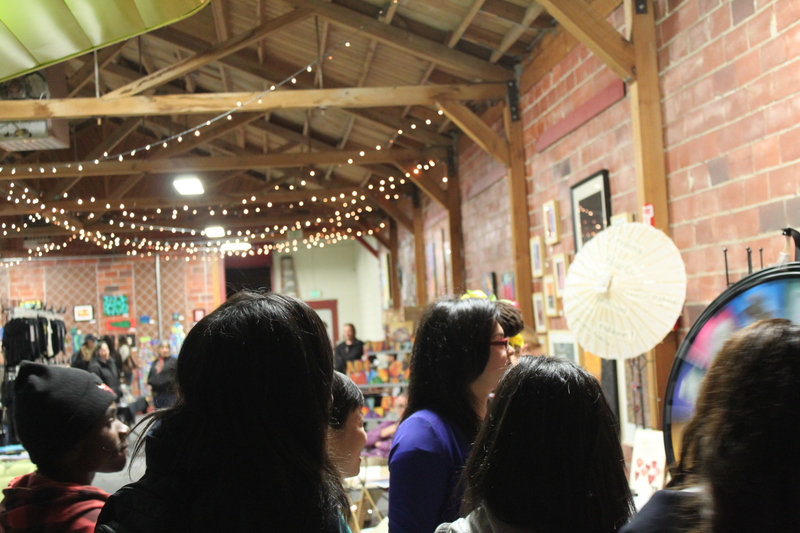 Here they are visiting Art Murmur in Oakland. Throughout the meeting, there was an air of trust, respect, and engagement. The youth gave meaningful feedback, there was mutual respect between youth and group leaders and a theme of collaboration running throughout the meeting. One example of collaborative art was a group poem written when a clipboard was passed around and each team member was asked to write one line of a poem, centered on their experiences in the Youth Action Team. Though a simple concept, the idea of involving youth in community development and empowering them to guide the direction of their evolving community is both innovative and impactful. Irene’s work is helping to ensure that the urban space being built is a grassroots initiative and truly of the youth, by the youth, and for the youth. This entry was posted in Uncategorized and tagged art, community initiative, East Palo Alto, EPA Social Venture Fellowship, grassroots, youth. Bookmark the permalink.